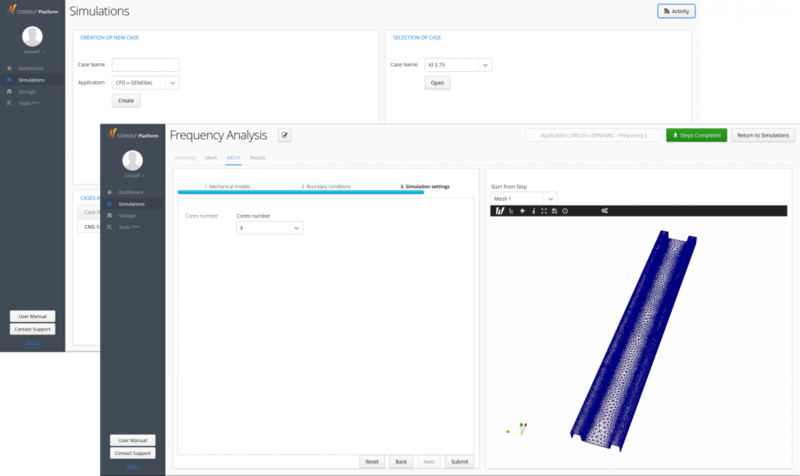 CONSELF Engineering Simulation Platform 2.9 is now online! 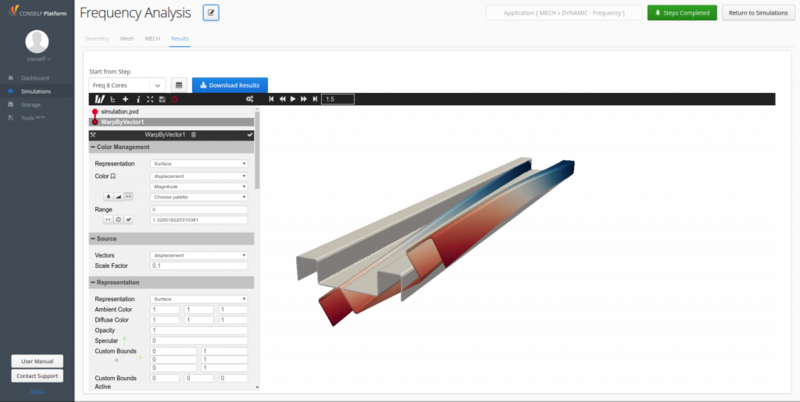 In this new version you will find a completely new App to calculate natural frequencies of a component and its modal displacements. You will also be able to prescribe the number of CPU you want for a given simulation, to monitor your recent activity grouping all analyses in one place, convert your colored STEP file to a colored STL and much more. Discover additional info in this post. With this brand new App you are now able to evaluate natural frequencies of your mechanical component as well as its corresponding modal displacements. The workflow is very similar to the one of the other MECH App, assuring a very smooth and fast adoption for novice users. When visualizing simulation results, a new “Table” button appears, it is used to show calculated natural frequencies. In the post processor solution file, you can find one modal displacement per each time step and easily visualize all of them. In the “Simulations” tab, on the top right, the “Activity” button allows the user to monitor most recent simulations, showing their status as well as their message. Right before submitting a new simulation, it is now possible to prescribe on how many CPUs you want to run it. Hexahedral meshing has been improved with a new algorithm able to better capture geometry features, improving discretization quality. An additional tool has also been added, it allows to convert STEP files to colored STL ones, with a one to one correspondence between STEP colors or faces and STL colors, that is a very useful feature to speed up faces selection to create boundaries. There is another great update! Starting from this new release, the 100% free WELCOME plan now gives you 1200 credits per year to run your test cases! Register and obtain the subscription in two steps as shown here.